Live & Confusion captured the magic and energy of Mundy in concert, recorded at a rammed Vicar Street in October 2005, a greatest hits at this point in his career, Live & Confusion managed to distill the excitement of a Mundy show into a visual and aural treat that is that rarest of things for a live album, inclusive – giving listeners/viewers a feel for what it was like to be there and providing the perfect snapshot of one of Ireland’s finest performers at the peak of his powers. The first single to be taken from Live & Confusion, July (Live), entered the Irish Charts on digital downloads alone at No. 16, the first ever song to do so. Steve Earle’s ‘Galway Girl’ which was included as an encore on the album became the biggest download in Ireland of 2007 before being released as a studio version, going to No.1 in and becoming the biggest single in Ireland of 2008. Live & Confusion continued to sell during Mundy’s run of festival performances and reached sales of 30,000 bringing him to massive audiences at Irish festivals like Electric Picnic and Oxegen as well as Glastonbury and The Cambridge Folk festival in the UK where Steve Earle guested with Mundy and Sharon for Galway Girl. 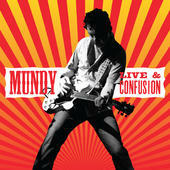 At the end of the Live & Confusion campaign Mundy started appearing with Sharon Shannon’s big band which also featured guests Shane McGowan and Damien Dempsey. The big band toured Ireland over xmas and did a very successful UK tour after Galway Girl was used in a Bulmer’s Cider advert!